There are few things in life worse than getting stuck on the side of the road when your vehicle breaks down. Unlike other mechanical problems where you can just drop your car off to have it fixed, you are left with very few options when your car will not even run. If you find yourself in this sort of situation, you can either leave your car behind or rely on the helping hand of our Morris County towing services. 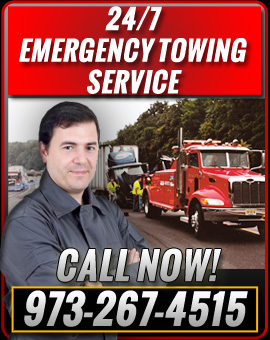 Whether you are around the block from us or farther away in Morris County, towing professionals can help get your car off the road and into the shop where we can address the problems your car is having. We always strive to treat your vehicles as if they were our own and this means preventing damage that can occur in transportation. Because we do not want you to be stranded outside of regular business hours, we have a 24 hour emergency service as well. Do not suffer longer than you have to without a car to drive around every day. The faster we can get you into our New Jersey service center, the faster we can put you back behind the wheel. If you would like to find out more about our Morris County towing services, call Mesler's Towing Service today at 973-267-4515. We look forward to helping you.